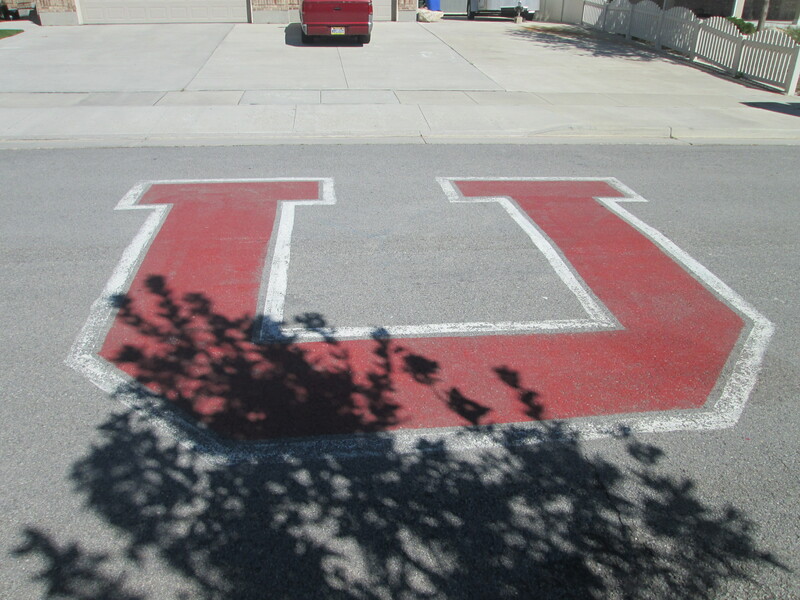 This week was a pretty great week, and as you can see by the picture I was able to take of a giant U in the middle of a street, the BYU vs. Utah game was some of the main talk of the week. The work has gone pretty well, but it was slow so it was a little more stressful because we were trying to find more and more to do to keep us busy; however, it’s all good because everything is starting to pick up in the area. We spoke in two wards yesterday and it was awesome, because I am excited to be here so that I can put myself out there and get to know everyone here. This stake has a ton of potential and I am excited to be here so we will definitely see what else we can work up while we are here. Transfers are happening this Wednesday, but I am probably going to stay here for another transfer or two, so I am not too worried about anything happening. Elder Mason isn’t quite sure if he will be staying or going because he has been in the area for about 4-5 months, but we don’t know yet so we will find out. I know this email sounds really boring, but I honestly don’t have anything more exciting that has happened this week! I Miss and Love All of Y’all!